Most marketing campaigns take months to prepare, so the thought of all your creative work disappearing overnight – like a ghost – gives so many retail marketing pro’s the chills. Snapchat marketing might seem intimidating, but the approach is new. The brands who can establish a loyal audience early will take first mover’s advantage and ride the Snapchat band-wagon to repeat-customer-generating success. I want to show you how a collection of innovative retail and ecommerce brands (including some you might even consider ‘old-fashioned’) have found a way to get their hands on winning Snapchat marketing formulas in the most daunting of social media apps. If your target audience is under 35 - you oughtta read up. It just takes a little humility. And a smidgen of youthful exuberance. Developing a loyal audience on Snapchat requires more storytelling ability, creative thought and production capability than you need to manage your Facebook, Twitter or Instagram accounts. Other social platforms are crowded by any self-proclaimed seller with a smartphone. Snapchat is still relatively clear of marketing noise from competing brands. You don’t need a huge budget, expensive equipment or videography skills to make it work though. You just need passion, commitment and a good understanding of how to entertain your target audience. To make it on Snapchat, you need to have a great product and a stand-out personality. Brands like GE and NASA are a hit the platform, even though their traditional audience doesn’t reflect the typical Snapchat demographic. The intimate nature of Snaps and Stories allow a new generation of people to build a connection with these brands and find out what they really stand for. No person still seems stuffy and uptight when they’ve got rainbows spilling out of their mouth. The same applies to brands. Snapchat is the place to develop an authentic portrayal of your brand. No need for fancy gimmicks, graphics or slick sales promotions. People use Snapchat to laugh and connect. Your brand can use this opportunity to develop an emotional connection with your target audience. You can turn that into loyalty when it comes time for purchase. Just don’t try to sell while you Snap. Stats don’t lie… okay maybe they do sometimes #FakeNews but 99% of the time you can trust in the numbers. There are over 300 million monthly active users on Snapchat as of January 2017, a third of which are active daily users. Not anywhere close to the gargantuan figures of Grandmaster Facebook - but remember Snapchat is comparatively vacant of your competition. Most users are aged 18-34 years old. In the US, 41% of all people within that age range are on Snapchat. Millennials still use Facebook, but younger generations are increasingly shying away from their grandparents’ social media platform of choice, favouring Snapchat’s as a primary communication application. Snapchat offers a highly concentrated audience of people who are really difficult to communicate with through traditional media channels. Millennials are watching less broadcast television, reading almost no newspapers, consuming almost no radio content, and learning the benefits of installing an ad-blocker to their devices. The app is also favoured by females, accounting for over 70% of users. The best part - Snapchat users are particularly engaged with content shared on the platform. There are more than 10 billion video views per day and the average user spends 25-30 minutes a day on the app. Snapchat has done a great job of providing innovation to social media and other companies are beginning to steal their creative ideas. Even though research suggests Snapchat will never dethrone Facebook, that’s not stopping Instagram from ‘borrowing’ some of its ideas. It's possible Snapchat might one day go out of business, but the same could be said of Twitter, Pinterest and even Tumblr. But while Snapchat is live and flourishing, those brands on the bandwagon early will yield the best results. There's a targeted captive audience waiting for ecommerce brands targeting the young online shoppers of the future. Are There Reasons Not To Be On Snapchat? If you are looking for compelling reasons not to be on Snapchat, you won’t take too long to find them. In the midst of the success stories, there are dozens of others who have wasted stacks of time, cash and effort on Snapchat marketing only to struggle to generate a return. But the same can be said for people who have tried to use any other medium to garner sales, from other social media sites to the big dogs splashing millions on Super Bowl ads that failed woefully. Nevertheless, there are legitimate concerns to consider. The most common complaint with the app - there are no metrics to fall back on. In our current data-driven universe, marketers want concrete results and measurable data. Ecommerce retailers are particularly aware of the benefits of analytics. You want to know where your internet traffic is coming from and how you can maximise your marketing spend. While Snapchat will tell you how many people viewed a video, you have no idea where your users live. If your online store doesn’t ship to their nation, there’s no real incentive for you to develop that relationship. *Oh yeah, you can also run targeted ads. Like almost any other online publication or app - Snapchat offers you the chance to promote your content to pay for more reach. Tread carefully with this feature. First, you're splashing some cash on content that won’t lead customers to your website. More importantly, the people you’re trying to target might have this reaction to your content if it’s too invasive or sales-focused. 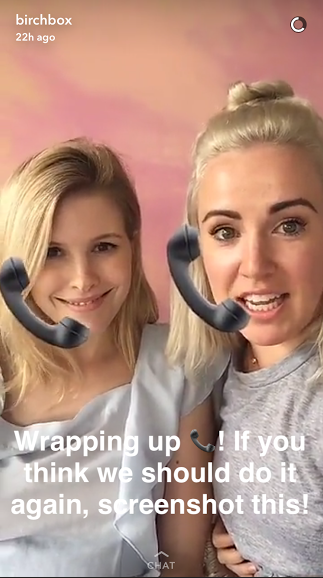 Snapchat has been slow to monetise their site, placing a cap on where and how to advertise. The site was created to be a fun-filled place to enjoy personal and nonsensical moments with your friends. Not a place to sell stuff to people. Advertising on Snapchat can cost you as little as $5. The price of advertising on Snapchat using personalised lenses or geo-filters is thankfully directly linked to usage, so if your costs skyrocket - it means a heap of people used your feature. Companies also benefit from more loyal followers. Most of the ten brands I’m about to feature have mastered the ability to use Snapchat to establish a personal connection with their fans to spread their message, develop trust, and eventually to develop more email subscribers and repeat sales. These retailers haven’t just used paid ads, they’ve have shown canny ingenuity with their content. While some have used their chunky wallets to amplify their message, others have bootstrapped their way to developing the same outcome - a loyal audience of passionate brand fans. In every brand example, there is a common thread - ecommerce brands succeeding on Snapchat focus on developing personal connections with their target audience instead of promoting. The sales come later when your brand fan’s trust is exchanged for repeat sales. When this food and travel video company was born in 2012 (just one year after the birth of Snapchat), the creators had limited places to showcase their highly creative visuals. YouTube was the king of video and the only platform with video capability and a significant existing audience. When Snapchat served up its ‘Discover’ function, Tastemade was quick to sink their teeth into this juicy opportunity. Not only could Tastemade publish a variety of videos across different channels, the brand had the chance to share off the beautiful visual assets of their products. Tastemade gets more than twenty million views of their videos on Snapchat monthly, and they make no effort to sell. It’s all about connecting with consumers and developing that emotional connection with high-quality, mouth-watering, stomach-churning content. This tongue-in-cheek post provides a simple, low-budget example of Tastemade’s Snapchat content. Note there is push to sell, just an interesting, entertaining teaser to lure potential customers to the Tastemade website, where the brand can gather an email subscription or entice a sale. Even though some of their videos and images are made specifically for Snapchat, Tastemade smartly repurposes this content to suit other social media formats. This cuts down the production time required for the brand to nurture relationships across different social followings. Co-founder Steven Kydd said Snapchat Discover aided the company’s global expansion to California, London, Sao Paulo, Tokyo and Buenos Aires. Nourishing result from a smart marketing approach requiring minimal production investment. If your target audience appreciates visual content, Snapchat presents a tantalising opportunity. Everlane’s approach to Snapchat has worked wonders for this innovative ecommerce startup. Just like Tastemade, Everlane makes no attempt to sell you clothes on Snapchat (they know the online store is the place to sell, not their social media channels). All they do is give followers a glimpse into their company, what the brand stands for, and make some new friends along the way. Everlane is about ethical transparency - a radical approach in the apparel industry. Their marketing needs to communicate why sustainable manufacturing is important and why people who care about this should support the brand. Everlane’s Snapchat content delivers by making all their operations and people seem real, fun, friendly and approachable. The outcome? People are approaching Everlane personally, all the time. Fans of the brand are eager to ask questions about the label, reach out for style advice, share pictures of them trying out the clothes, or some just want to show the company their excitement upon receiving their order. Even better - Everlane is treating Snapchat like a miniature television network by developing a regular series called Transparency Tuesday. Not only are they making more sales, they are inspiring other companies to make a stand and commit to transparency. Everlane doesn’t just want to sell more shirts - they want to inspire young people who want to go into fashion design for the right reasons. What Red Gaskell (Everlane’s head of social media) has done is make customers feel like a part of the company. This radical transparency proves to customers and followers that Everlane truly cares about their cause. If you share that passion, of course you’ll buy clothes from this brand! "You can't be faceless if you want to be successful," Social Media Manager Red Gaskell said. "People want that familiarity. And sometimes we do stories where no one is on camera, but for the most part they know there is an actual person replying if we send a message. It's important they know that there's a face there." This is another mobile-focused company who know people within their target audience are digitally savvy, tuned into Snapchat, and highly engaged with interactive apps (often more so than the internet). Therefore, instead of trying to create a new space for their demographic, they went to where their audience hangs out to try and spark up new relationships. A survey by the Bank of America found 39% of millennials interact with their smartphones more than they do lovers, family, friends, co-workers or even children. Yikes! While this might be troubling news for society in general, it should present a lightbulb moment for ecommerce marketers. According to recent Google research into how people use their devices - more people use social apps than they use emails and shopping apps. If your audience is so engaged with a few key platforms, you can meet so many potential customers on this small number of platforms rather than spreading your marketing work across the internet or offline avenues. This brand has managed to wander into the cool kids’ Snapchat party and strike up a bunch of friendships without coming across as an unwelcome gatecrasher. The food delivery company has one of the most engaging social media accounts anywhere. Instead of churning out one-sided rhetoric, they invite followers to respond to their content. Grubhub have used competitions to their advantage, adding an incentive for users new to the brand to get involved and engage. Grubhub knows what type of content their audience responds to, and they’ve nailed down a unique tone that fits in perfectly on the cool kids' new social media platform of choice. Who could resist the charms of a white-water rafting chocolate brownie? Everyone needs underwear, and Snapchatters are the generation who are starting to buy their own for the first time. Meundies products are designed for young, style-conscious millennials. So why not use Snapchat to convince these new buyers that Meundies is the brand worthy of their loyalty? While others griped about the fickleness of the app, MeUndies social media lead Bob Wolfley was keen to get right down to business. A brazen, independent attitude like Bob’s will help you succeed with Snapchat. Meundies didn’t buckle because of the lack of metrics available on the app. What did Bob do instead to measure success? He made up his own tracking process! Bob created custom URLs found only the app, so whoever clicked-through could be tracked and recorded as a Snapchat referral. ‘Why didn’t I think of that?' Sigh. Simple trick, but one worth stealing. Bob discovered the app converted a higher percentage of shoppers to their site than any other social media platform. That’s a comment you could be making sometime soon if your brand embraces the Snapchat community. Much like Meundies, Featsocks is another brand aimed at a younger generation of buyers, who like all things quirky, unique and quality. Hmm, where can one find a bunch of young folks who want to spend money on things that make them feel good while maintaining their individuality? Unfortunately, the answer might not be Facebook. If your ecommerce store is trying to attract young people (teenagers in particular), best not to hang out with them on the same social platform their parents prefer. Snapchat holds a huge chunk of your potential buyers. Companies like Feat Socks understand the digital population’s shifting demographics. Just having a presence on Snapchat sends the message your brand is not just for old folks. Meundies share behind-the-scenes footage, launch new products and give discounts to regular users - rewarding and encouraging loyalty. I dare you to find an industry that seems less interesting. Who in their right mind, gets excited about buying a new bed? It’s a mattress. It just lies there. It doesn’t go anywhere, it doesn’t do anything. You can’t even take a picture of it for entertainment. Not even Kanye can make that work. Casper knew they needed to generate interest and attention from a younger generation of buyers to stand out from the traditional mattress retailers most people couldn’t care less about. This innovative ecommerce startup didn’t want to fall into the same hole as other mattress manufacturers. They wanted their audience to associate a positive emotion - one of excitement - with their brand. So, instead of selling products, Casper started selling emotions. Lindsay Kaplan, Casper’s VP of Communication, thought Snapchat was the best avenue to make that happen. You don’t have to have the best marketing agency to be successful on Snapchat. You could be the little guy just starting out, but if you can be relatable and playful in your thinking, you can win your Snapchat crowd’s affection and loyalty. Casper knows how important regular, consistent content is to develop a loyal following. The brand releases a new snap every day, and their appointment based series, Waffle Brunch Wednesdays has developed a cult-following by treating Snapchat as a miniature television network and priming followers to tune in at the same time for the same type of program each and every week. Every Wednesday, the team goes to a new waffle brunch place. The content is not just about mattresses - Casper gets that millennials don’t want to spend their spare time consuming ‘entertainment’ content about mattresses - instead, the series relates to relaxation and enjoyment and not waiting to get back to bed after a heavy lunch. This concept relates the brand to the audience’s sleep habits. When it comes time for a follower to invest in a new bed, Casper is positioned as the brand for the millennial shopper. Snapchat is all about interacting with your audience and trying to meet more potential customers, by delivering relevant to develop a genuine connection to your brand. Just don’t sleep on it - you need regular valuable content to develop the brand loyalty you need for repeat sales. Birchbox spread its wings just a year before Snapchat was born. The brand sends cosmetics samples for men and women to help users save money while trialling new products. Birchbox's innovative ecommerce business model is perfectly designed to attract a young, digitally savvy audience. The convenience and value of subscription box commerce appeals to the exact audience using Snapchat almost religiously. Birchbox began experimenting with customer service on Snapchat last year. They asked customers to contact them for no apparent reason other than developing stronger connections with brand fans, and the trial was a success. Birchbox is constantly innovating and looking for new ways to engage with fans through Snapchat. The brand recently ran a test around Black Friday 2016 to gather responses and feedback directly from their followers on Snapchat. Exclusive deals and promotions for your Snapchat fans will make them feel particularly special, and help you develop your own little club of passionate advocates. Birchbox set up a unique URL on Snapchat to see which of their followers responded, while also using Instagram Stories ‘see more’ feature to do the same. Birchbox found more followers going to their shop from Snapchat. Just another Snapchat Success Story. Prepare entertaining content, meet potential customers, develop their trust, then convert that trust into sales. The system works. Wet Seal was made for Snapchat. The once-popular retailer with mass appeal to teenagers, blazed a trail on the platform by tapping into something many others would follow: takeover marketing. While many people are now familiar with takeovers, few know that Wet Seal was one of the first to use it with laudable results. Snapchat’s brand of influencer marketing allows users to swap control of their pages for a limited period. This move is usually pre-empted by an announcement so that individual’s followers will go to the other person’s handle to check up on their favourite snapper. Wet Seal approached beauty blogger MissMeghanMakeup, who had over 300,000 followers on social media, to lead the site for two days. Meghan went about her normal routine while wearing Wet Seal apparel (which she only mentioned sparingly). She made Christmas cookies, played with her dog and did normal teenage girl stuff. Source: wet seal snapchat via AdAge. The outcome shows exactly how easy it is to use influencer marketing on Snapchat to build your audience fast. Wet Seal snagged 9,000 new followers off 6,000 story views. Not bad for a company new to Snapchat over the winter of 2013. The Ecommerce Jungle Gym is a huge fan-boy of the zany bro shorts online retailer with one of the best online marketing games in the ecommerce biz. Chubbies even took out the top gong at the Jungle Gym's Best Of Ecommerce Awards. Right from the start, these two were bound to meet and make some serious magic together. The bright-coloured men's shorts startup is a social media sensation, dominating on Facebook, Twitter and YouTube. You can add Snapchat to that list. These guys know exactly where their target audience of fun-loving college bro's hang out online - and they know exactly what type of content they need to develop to entertain this audience. Chubbiest couldn’t be a better fit for Snapchat. Chubbies Shorts was founded in 2011 by four friends from Stanford. Snapchat was founded in 2011 by three friends from Stanford. Chubbies makes wacky, quirky and genuinely laugh-out-loud hilarious videos to share with their Snap fans. Chubbies produces a weekly mini-movie published each week on Snapchat. The movie has absolutely no connection to sales. Instead, the content is simply designed to delight the Chubbies audience. This movie keeps developing a stronger bond between Chubbies and their followers, to the point where buying shorts from a competitor would almost feel like adultery for these adoring fans. Finally, we have a company with decades of experience in the traditional retail marketing business, with a luxury target audience and a reputation for refined, classical elegance. None of this screams Snapchat. How can the app's teenage-skewed demographic afford a thousand-pound Burberry trenchcoat? The luxury retail brand has always been creative in its marketing, and Burberry is constantly trying to evolve its image and capture the attention and lust of the next generation of luxury buyers. Snapchat marketing is not the domain of luxury retailers. Burberry finds it very easy to stand out. Like all of the ecommerce Snapchat success stories I've shared - Burberry isn’t using the app to try to sell clothes. They shot beautifully filmed videos that told captivating stories, by enlisting a Hollywood director and some supermodels Now this might sound like cheating, but hey, if you’ve got it use it. And oh, Burberry used it. From sponsored lenses to behind the scenes stories and product launches. If Snapchat had it to offer, Burberry milked it. They were the first luxury brand to have a Discover channel. No actual figures or confirmation on ROI is available from Bruberry HQ, but the brand has been able to develop relationships with their future target demographic before any of their competitors. By investing in connections with this young demo, Burberry is making sure the next generation of wealthy shoppers grows up dreaming of that Burberry trenchcoat purchase. These Snapchat marketing success stories carry a lesson any ecommerce brand can learn from. Social media marketing works best when you try to develop relationships with your target audience. Snapchat, like any other social platform, is not designed for selling. In stead, you can use this channel to meet new potential customers and develop trust, authority and loyalty with your brand. You can turn that loyalty into repeat sales when your customer is ready to buy. Your online store will do the converting. Your Snapchat marketing will do the attracting. Don’t Be Too Serious - No one goes to Snapchat for a serious, in-depth study or exposure to a brand. Connect With Real People – Instead of presenting as a slick, corporate, faceless machine, let customers interact with your staff, get to know you by name and get a glimpse behind the scenes. Be Consistent – To be on Snapchat you have to develop regular, valuable. Always update your feed. Keep the content flowing. It may sound like a lot of work, but it yields results. If you can't commit to daily or weekly publishing, make one big monthly effort at the same time on the same day so users get accustomed to your series. Don’t Sell, Tell – Share your story, and meet your customers. Don’t try to pitch them. People don't use Snapchat to search for products. Roll With The Punches – Not everything will go according to plan, but keep learning and keep evolving. A final caution is to maintain your brand image. When people interact with a fun, jolly company on Snapchat, they expect the same joviality when they walk in through a physical store, shop your online store, or call your customer service team. While Snapchat can be used to build a loyal following, you'll struggle to convert that connection into sales if the rest of your brand's marketing doesn't feel like the same friend your user fell in love with. A disconnect with your online store, your other marketing, or your customer service, could cost you the loyalty you've developed. Be authentic on Snapchat. Be consistent with the rest of your brand's customer experience. If you have tried Snapchat and it didn’t work out for you the first time, don’t give up. We hope these brands will inspire you to try different tactics and that you finally find a formula that works. The rewards – through sales or brand loyalty, are immense. For more detailed help about how to use Snapchat for your business, make sure you browse through and read any of the other articles published on eTraffic's dedicated Snapchat marketing website. Cameron Francis is the co-founder and Managing Director of eTraffic, a Melbourne-based creative and digital marketing agency. He is passionate about helping online retailers of all sizes improve their online visibility. Cameron and the team at eTraffic have particular expertise with Snapchat marketing - helping brands looking to attract new audiences with regular, quality Snapchat content.